Here we see the crossroads on the High Street which today is a busy junction with traffic lights. The picture is taken from Over Rd. and the Salvation Army Band are setting up to play – not a safe strategy these days! It is probably Sunday and about 4pm based on the shadows. Behind you can see the original “Black Bull” pub which was demolished to widen the road at the junction after replacement by the current pub. 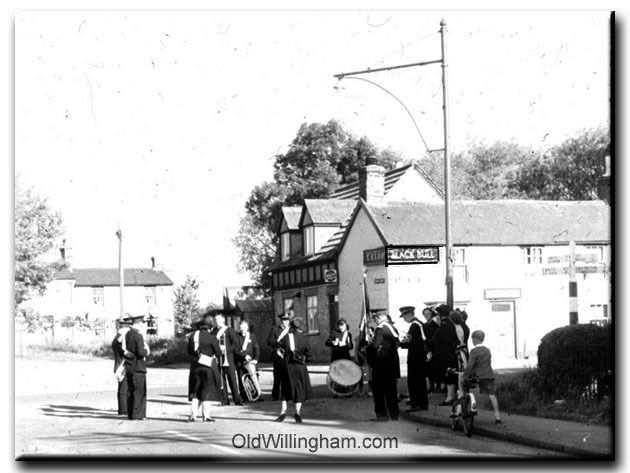 This picture is probably taken in the early 1960s when there was relatively little traffic in the village – especially on a Sunday.